I was introduced to several appealing exchange-traded funds (ETFs) during a recent conference call that I want to bring to your attention starting this week. Today, I will feature the first of these funds, the SPDR SSgA Global Allocation ETF (GAL), a world allocation fund from the State Street Group. This fund has its holdings in a globally diverse selection of ETFs. That’s right; this ETF invests in other ETFs — across several different sectors. The fund’s holdings primarily are in international equity, bond, and emerging market funds — providing an interestingly diverse investment opportunity. GAL is down slightly so far this year but so are most equities. The fund began the year at $30.08 but had slipped to $28.15 on June 6. Lately, the fund has been showing signs of recovery. As a result, now could be a good time to buy the fund if you think it may have bottomed out. Before you do so, here is a brief description of the SPDR SSgA Global Allocation ETF (GAL). The fund seeks to provide capital appreciation by investing in ETFs registered under the Investment Company Act of 1940, which seeks to track the performance of a market index, exchange-traded commodity trusts and exchange-traded notes. 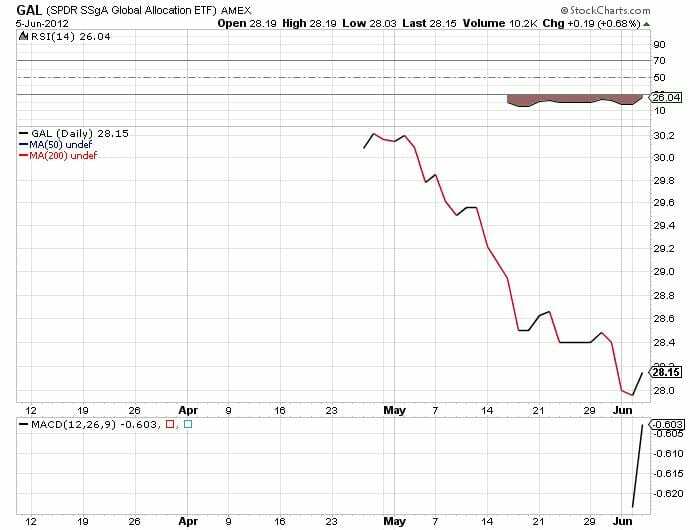 As of June 5, GAL’s top five holdings were: SPDR S&P 500 ETF (SPY), 22.90%; SPDR S&P World EX-US ETF (GWL), 15.47%; SPDR Barclays Capital High Yield Bond ETF (JNK), 11.05%; SPDR Barclays Capital Intermediate Term Corporate Bond ETF (ITR), 8.34%; and SPDR S&P Emerging Markets ETF (GGM), 7.73%. GAL is attractive partly because of the way it seeks to create a globally diversified portfolio that includes broad coverage of subsectors across the equity, fixed income and alternative investment landscapes. The fund’s diversity provides much sought-after stability in this uncertain financial climate. In addition, the fund is low-cost, low-turnover and tax-efficient, boosting its appeal to investors.